DYNAFOR the new shape of check-weighing and load measurement today! DYNAFOR MWX MINIWEIGHERS: micro-processor based electronics with new standard functions and systems. operation and set up by 3 push-button controls: ON/OFF, 100 % tare, with return to total load applied, and peak hold, to show the maximum load applied. up to 700 hours operation before battery change, with low battery indicator and automatic shutdown after 20 minutes to save battery power. choice of unit of measurement: kg, tonnes, lbs, short tons, daN or kN, displayed on the LCD. overload displayed to help prevent overloading the equipment and systems. automatic zero when switched on. output for connection to hand held display and controls, to P.C. or interface for processing or printing the information. variable response rate, to save battery power. accuracy to ±0.2 % of capacity. reliable operation, compact and rugged construction. ambient temperature range —14° F to +104° F (-10° C to + 40° C). large top shackle and bottom hook. model (MWX-IR) with infra red controls (OFF, tare, peak hold). hand held display, with integrated push-button controls (ON/OFF, tare, peak hold). The DYNAFOR MWX MINI WEIGHER range of load indicating devices with large 1 3/4″ (44 mm) LCD are highly accurate instruments for load checking goods and materials, for check-weighing and measuring tensile forces. They are suitable for many check-weighing uses in industry, on job sites, in laboratories or on test benches. 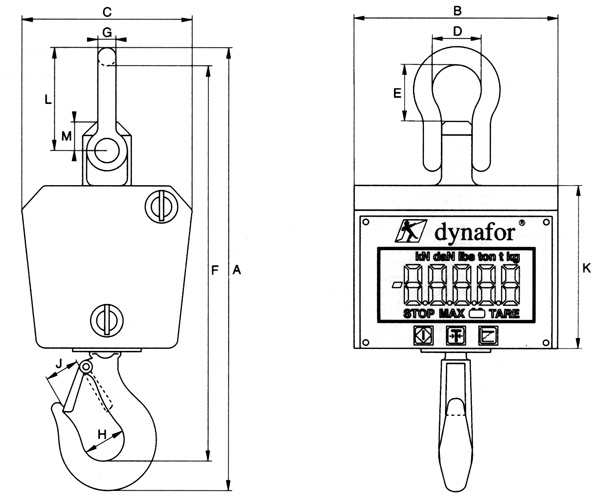 The DYNAFOR principle is the movement of a material within its elastic limit, using bonded strain gauges to give an electrical signal under strain, relative to the load applied, and displayed on the LCD.